BAFX Products Anti Shock Hiking/Walking/Trekking Trail Poles – The Cheapest Option for Everybody on a Small Budget! Foxelli Trekking Poles – Collapsible, Lightweight, Shock-Absorbent – The Best Shock-Absorbent Trekking Poles! Hiker Hunger 100% Carbon Fiber Trekking Poles – The Best 100% Carbon Trekking Poles Under $100! Equipeak Collapsible Folding Hiking & Trekking Sticks – Best Collapsible Trekking Poles Under $100! Trekking Poles: How Necessary are They? Though not an essential tool like a hiking backpack, trekking poles provide their users with extra stability and balance. In this advanced, technological age, the trekking poles available on the market today are far from mere sticks. With features based on modern scientific research findings and with integrative capabilities, the right set of trekking poles can contribute to the overall success of your hike, whether heading cross-country or taking a leisurely stroll. Adjustable: For enhanced stability on a variety of different terrains, many trekking poles have an adjustable length option. The typical adjustment lengths range from about 24 to 55 inches long. Generally speaking, you will want to shorten your poles if you are going uphill and then lengthen them for traversing downhill. Non-adjustable: There are some trekking poles which do not offer adjustments in the length. ‘Fixed-length trekking poles’ are typically lighter in weight as opposed to an adjustable pole as they operate with fewer parts. This makes them very popular among those who prefer light and ultra-lightweight tools. These are the perfect choice for activities in which you know you will only require a certain length pole. Foldable: Foldable poles, true to their name, fold for storage (similar to tent poles), rather than adjustable poles, which collapse into themselves. Foldable poles are generally the easiest to pack and are often very lightweight and allows for rapid deployment. These are very popular with those interested in ultrarunning and fast hiking. Shock-absorbing poles: With internal springs which help to absorb shock when you are walking downhill, shock-absorbing poles provide even more extra stability and balance. When walking uphill, many poles offer the ability to turn off this feature. Shock absorption is a helpful addition for any hiker but, for those who have wobbly knees or ankles, unstable hips, or have experienced any previous issues or injuries to those joints it can be especially helpful. Standard poles: Standard poles do not come equipped with shock-absorbing qualities. Many are lighter in weight and, due to that fact, generally less expensive. Though these poles will not absorb shock as well when going downhill, they do allow for a comparable level of support and stability as their shock-absorbing cousins. Ultralight: Offering the benefit of less swing weight, which makes these poles easier to maneuver, ultralight trekking poles allow for less strenuous operation. 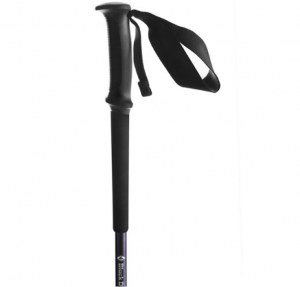 When hiking for long periods of time, these trekking poles will help to reduce fatigue and muscle weakness. The determining factor of the pole shaft’s overall weight is the material from which it is made. Those poles which weigh less than 1 pound per pair are considered by REI to be ultra-lightweight. Camera mount: Some trekking poles even include a built-in camera mount, usually found under the handle, which enables the pole to be able to be used as a monopod. Capturing memories in the middle of the wilderness and/or as events are unfolding has never been more efficient and simple! General Hiking- Adjust the length so your arm makes a 90-degree angle bend at the elbow as you hold the poles with the tips on the ground near your feet. This will ensure the proper length for a great deal of your hiking. If you are using poles which have three sections, it is essential to have the top setting be in the middle range, then the bottom setting should be adjusted to the length which will put the hiker’s arm at the proper angle. Then, if you find yourself needing to make adjustments during your hiking trip, you can use just the top setting to adjust the length of the poles. Uphill Hiking- Shortening each pole by approximately 5 to 10 centimeters will afford better leverage and more secure pole planting abilities. On steeper slopes, you will find shortening your poles highly beneficial. Trekking poles should assist the hiker in moving uphill without causing muscle fatigue or strain to the shoulders. If your shoulders feel as if they are in an unnatural position and/or your backpack straps are digging into them, you may need to shorten the setting on your poles a bit more until you find the most comfortable fit. Downhill Hiking- In lengthening each pole by approximately 5–10 centimeters from the initial length you chose for your general hiking purposes, the diligent hiker will keep their body more upright, thereby delivering better balance. Long Hikes- The hiker has the ability with adjustable trekking poles, to lengthen the pole on the declines and shorten them on the inclines as needed. This will serve to improve stability and comfort throughout the hike. Many who enjoy extended stays in the outdoors and wilderness will also express a distaste for monetary gains and/or materialistic views. As such, many, though certainly not all, claim a modest income. For those who are on a budget, attaining quality tools and products can be even more potentially grueling of a process than it is for those with a more disposable income. 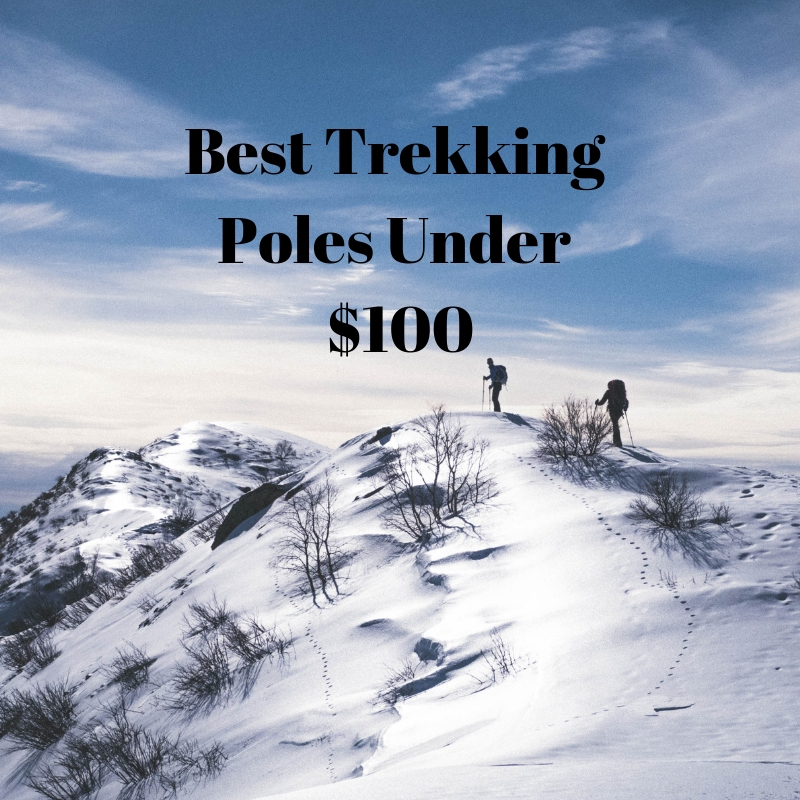 To combat this below is a comprehensive list of the top five highest consumer-rated trekking poles under 100 dollars available on the market today. Black Diamond is a company which makes one of the best trekking poles, but unfortunately, most of the models are very expensive. The good news is that they do have a few modes which are suitable for people on a tight budget. This model offers dual FlickLock mechanisms which provide complete control over adjustability allowing the hiker to traverse the terrain at hand. With long flex tips and low profile trekking baskets along with rubber grips with rib patterns to reduce vibrations, the Black Diamond brand has seemingly thought of everything! Including non-slip EVA foam grips, these poles give you options on where to grasp, ensuring the most comfortable hiking experience possible. This pair of trekking poles also comes with variable-width nylon webbing straps which are woven into the lining for even more increased comfort. Sporting 3-section aluminum shafts, the overall quality craftsmanship, along with the indispensable features make the Black Diamond Trail Back Trekking Poles one of the most popular choices when considering the best trekking poles under 100 dollars. One of the drawbacks to consider for this model revolve around their use of plastic for the locking mechanisms. Users may experience an ineffective FlickLock using it long-term. The BAFX hiking poles were designed for beginner & experienced hikers alike. These hiking poles have recently been upgraded, offering more comfortable grips and even padded wrist straps for added luxury. The grips sport an advanced ergonomic design with minute ribbing for an added control. In an effort to prevent chaffing, the wrist strap is padded and wider than previous iterations of this model. The poles can extend from roughly 25.5” up to 52”. Also equipped with a built-in anti-shock spring, this feature will ensure a less jarring hiking experience across many terrains. There are even eight markings on each of the poles for swift and simple length adjustment at any time. Crafted using aircraft grade aluminum, these trekking poles are durable and light, making them not only affordable but also a great choice for beginner hikers. Each pole weighs approximately 12.4 ounces, including the tips. With all of the features, quality materials, and intelligent design of this model, it is no wonder they have made it to this spot on our list of the best trekking poles under 100 dollars! Potential drawbacks for this product include consumer reports of faulty locking mechanisms and weak pole material causing premature breakage. But in general, the BAFX hiking poles are a very good product. These poles are made from ultra-lightweight, shock absorbent, 100% carbon fiber material. They weigh only 7 ounces, allowing for a reduction in arm fatigue and thus enabling the hiker to exert less energy while moving faster and covering more terrain. Their strong, durable design is sure to withstand even the toughest trips. With Quick Lock technology, hikers can adjust each pole’s length swiftly and simply. Professing a retractability length from 24” to 55”, Foxelli trekking poles are compact and versatile. Also with anti-slip cork grips, which adjust to the hands and absorbs sweat, ventilated, padded wrist straps, and ridged extended EVA foam sleeves, these trekking poles are perfect for rough terrains and switch-backs. The tip is made of Tungsten Carbide for added strength and durability. This product also includes a handy carrying case, as well. One thing that I personally don’t like about this mode is poor quality glues and tip materials causing either the poles to snap in half or the tips to break off, respectively using them long-term. But for its price, I think that we can’t complain at all. Made using high quality, 100% Carbon Fiber, these ultra-lightweight poles weigh only 7.6 ounces each. Hiker Hunger trekking poles feature a Quick Flip Lock which offers the ability for the hiker to collapse or extend their poles from 24” (60.9 cm) and up to 54” (137 cm) fairly quickly. These poles are easy to collapse when not in use, and even small enough to pack in the Carry Bag provided with the purchase. Each pole can be separated by section to be only 21″! Also sporting a cork grip that is moisture-wicking, comfortable, and conforms to the hiker’s hand, these poles will fit like a glove! Under the cork grips, is a layer of EVA foam to ensure extra stability and comfort. In a conclusion, I can say that this model is one of my favorite in this reviews, but also probably the most expensive one coming closer to our $100 cap. Consumers have reported drawbacks with this product in regards to poor quality glues and craftsmanship resulting in breakage during normal wear and tear. Equipeak poles have a unique and easy-to-use folding system that fixes the pole into one solid piece, with a Flick-Lock on top that is easy to reach for a convenient fit of height. This design makes these 7075 aircraft-grade aluminum poles ultra hard and ensures that they will hold up under any conditions. The company professes these poles will “Never Fail”. Weighing less than 10 ounces per pole, and folding down to less than 15″, they will easily fit into carry-on luggage or hiking backpacks. With the ability to absorb shocks and vibrations, reduce muscle fatigue and potential joint pain, drastically improve balance, thereby helping to prevent falls, it is not surprising to note this brand was designed by and for hikers. With a sweat repellant, shock absorbing, cork grip, including EVA foam extensions for added versatility and an adjustable wrist strap, durable Carbide Tungsten tips for incredible traction and grip with rubber protectors, and a pair of dedicated baskets for traversing slippery terrain, these sturdy trekking poles have definitely made the cut! Concerns surrounding this product revolve mostly around an issue with the spring-loaded pin. Consumers have experienced telescoping and collapsing, despite the manufacturer’s guarantee. But despite this drawback, the Equipeak’s model is a very strong contender in the battle for the best trekking poles under $100. Using trekking poles when you hike, helps to build your endurance. When hiking without trekking poles, you are engaging only your leg muscles. In hiking with trekking poles, you will also be using your arms, which builds overall body strength, allowing you to hike longer and farther before tiring. When hiking with a heavy backpack, utilizing trekking poles assists in supporting the knees and ankles. Trekking poles will aid in the displacement of the effort necessary to climb upwards as it allows one the ability to utilize their arms to themselves forward. Trekking poles will help the hiker to develop a consistent rhythm, which, over time, can increase their average hiking speed and efficiency. If you are hiking in rough, wet, or slippery terrain having four points of contact, rather than your own two feet, will help in maintaining balance. Whether you’re a beginner hiker or have decades of experience, it is essential to understand your needs and limitations and the features and potential drawbacks of any trekking poles before moving forward with a purchase, regardless if you are shopping online or in a physical store. Choosing the wrong pole, or a sub-par product can lead to disastrous consequences and may even end up putting your life or others’ lives in danger. For centuries, humans have been making use of sticks, canes, crutches and other devices to assist with our walking, hiking, and other two-legged traveling needs. As with everything else in the modern age, many of these products have been developed alongside a growing understanding of how our bodies act, react and conform in certain situations. The information and data which has been garnered from years of research in all different areas pertaining to this subject have enlightened nature lovers all over the world. Progress is inevitable, and even more so when there is a growing demand for more effective procedures and tools. If only our ancestors could see us now!